Moving into its third year of revival, 2018 Topps Gold Label Baseball is again exclusive to the Hobby format. Collectors can find one framed autograph per box, plus at least four base parallels. This is the same basic output as 2017. While each box promises 35 cards, the bulk of the action comes from the base set. The 2018 Topps Gold Label Baseball checklist features multiple eras of MLB greats, including past and present stars, as well as top rookies. The 300-card set is broken down into 100 cards for the Class 1, Class 2 and Class 3 subsets. So, although there are only 100 subjects in the base set, every player has three cards featuring different dual images, with each one falling at a different rarity. There are also parallels that cover each Class, including Black, Blue (#/150 or less), Red (#/75 or less) and Gold (1/1) editions. Of course, 2018 Topps Gold Label Baseball has quality hits, too, with one Framed Autograph expected per box. These add limited Black (#/75 or less), Blue (#/50 or less), Red (#/25 or less), and Gold (1/1) parallels. 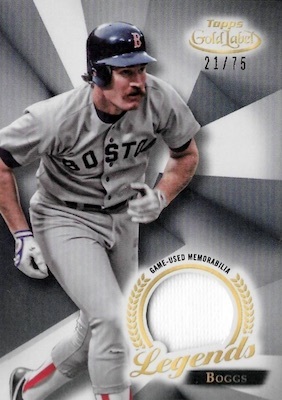 More elusive are the Golden Great Autograph Relic cards, which are capped at 50 copies (or less). In addition, MLB Legends Relic cards, numbered to 75 or less, highlight memorabilia pieces from some of the top players of all-time. Both relic sets also have Black (#/5) and Gold (1/1) parallels. 2018 Whit Merrifield Topps Gold Label Framed Auto Error Card Rare! 2018 Topps Gold Label Jose Canseco Framed Autograph Card!!! Buy 2018 Gold Label boxes direct from Topps for $66. 300 cards, including 100 of each class and three cards per subject. CLASS 1 PARALLELS: Black (1:2), Blue #/150, Red #/75, Gold 1/1. CLASS 2 PARALLELS: Black (1:6), Blue #/99, Red #/50, Gold 1/1. CLASS 3 PARALLELS: Black (1:20), Blue #/50, Red #/25, Gold 1/1. Shop 2018 Gold Label MLB autographs on eBay. PARALLEL CARDS: Black #/75 or less, Blue #/50 or less, Red #/25 or less, Gold 1/1. 21 cards. Serial numbered #/50 or less. PARALLEL CARDS: Black #/5, Gold 1/1. 25 cards. Serial numbered #/75 or less. See the full 2018 Topps Gold Label Baseball checklist spreadsheet. Call me stupid! I bought a case of this last year and the case hit was a Jose Canseco auto. Said don’t do, but I did anyway. Five packs purchase of 2018 Gold Label before I came to my senses and said, ENOUGH is ENOUGH. Boxes at the local were $69.00 Of the five autos I pulled, if I sold all five, doubtful I would get back the price of a single box. There has to be some good autos in this product, but I have yet to see them. One star because you can’t give it zero stars. Never again! Uh, I got a gold framed Ohtani autograph (one box opened only), and according to the checklist it says 1/1, but mine is not numbered. Am I missing something? Base autographs all have a gold frame. The parallels deal with the background color of the card and are also serial numbered as indicated. 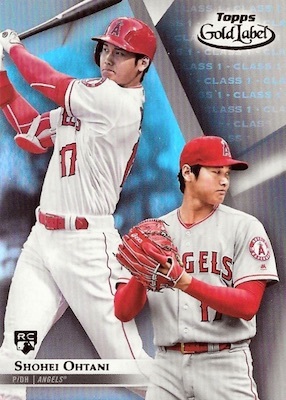 You have the base Ohtani autograph, which is still a great pull. Congrats! 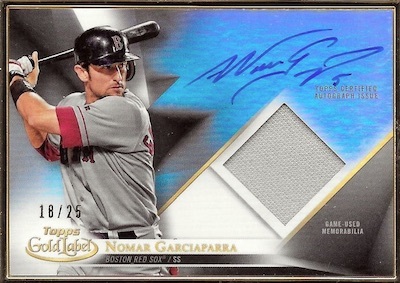 One Detroit Tiger ( Cabrera -with class 1,2,3 ) 1 Auto / Relic) – Case hit . So 3 cards & 1 extreme rare card . Had a 8 box break – NO CARDS !!!! What I don’t like in this product is the similarity between present and previous years designs. Cardstock in the 2017 iteration was good but the glossy finish made the card feel cheap in my hands. 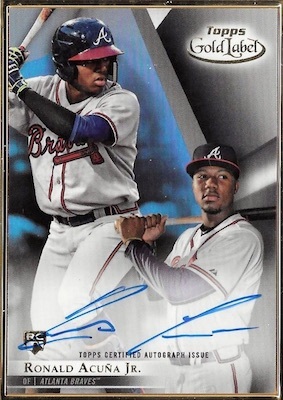 I have yet to put my hand on 2018 Gold Label, so in terms of design and hits, it looks good, but not great. Gold Label is a mediocre. Base design is bland and generic. Inserts are terrible. The gold frame would be nice if it were exclusive to the product. Awful, even worse than I expected. In my box of 35 cards, no rookies and mostly hall of famers, a worthless auto and two worthless parallels. Couldn’t even get a good base card. Opened a case and a half (at different LCS’s). Great Trout /10 auto and a Judge auto redemption. Frank Thomas auto /15. Otherwise, the other 21 boxes had mediocre autos at best. But this isn’t the problem – the problem is the defects in the cards (non-autos). Many cards have a defect in the top right of the card where the color is chipped away. Also – other cards with a horizontal line near the top. Quality control has been less than acceptable in this product. It appears that while most have a base version (i.e. not numbered), several of the bigger names seem to only have numbered parallels. This is pretty standard for Topps.